New and Modern! 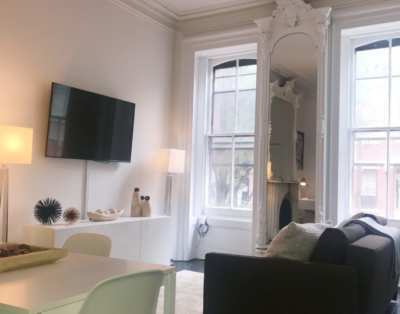 this Gorgeous, inviting and Cozy Junior 2 Bedroom duplex apartment is located in Prime midtown west, just a couple blocks from Columbus circle! ! Come and get your taste of a real New Yorker’s life. This Apartment is Completely NEW! Even features a BALCONY! Designed and furnished with great emphasis on comfort, luxury and detail, Bright and full of light this homey apt is warm and sophisticated and suitable for all. The kitchen is fully equipped with brand NEW appliances, even a Washer and Dryer! A/C. Modern and Chic Bathroom, Dining Table, Spacious Fun and warm Living area with Flat Screen TV, full size Sofa-Bed, designated office space. Great closet space throughout the apt. Bedroom features a Queen Size Luxurious Bed, a Flat Screen TV, |||The Second Bedroom features a Full size Bed|||.